Orlando, Florida | Redi Pedi Pedicab Company | Exhibitor sponsorship and marketing opportunities are available at the Orange County Convention Center via Redi Pedi pedicabs, a.k.a. rickshaws or bicycle taxis. Redi Pedi Pedicabs at the Orange County Convention Center in Orlando, Florida. Advertise to convention attendees with pedicab advertising inside and outside the convention center. 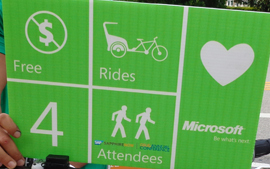 Exhibitors can expand their marketing presence beyond their booth with Redi Pedi pedicabs. Redi Pedi exhibitor marketing and sponsorship opportunities make an impression at and around the convention center. Sponsors offer free pedicab rides at the Orange County Convention Center. Redi Pedi pedicabs stage at all the main entrances and exits of the Orange County Convention Center. Stretch the marketing budget with a team of pedicabs at the Orange County Convention Center. 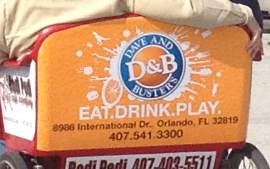 Learn More!Redi Pedi Pedicabs offer the best in convention sponsorship, exhibitor marketing, and business advertising opportunities in Orlando, Florida. Call 407.403.5511 for more information or email info@redipedicabservices.com. 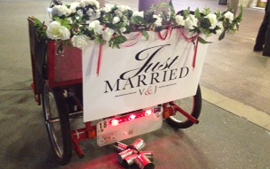 We assist the bride and the groom with making a grand exit on their wedding day complete with flowers, a “just married” sign, and, of course, cans strung from the back. Exhibitor marketing and sponsorship opportunities are available for conventions, expos, and events via pedicabs, rickshaws, and bike taxis. Redi Pedi is often looking for energetic and outgoing individuals to add to our team of pedicab drivers in Orlando and Daytona Beach, Florida. 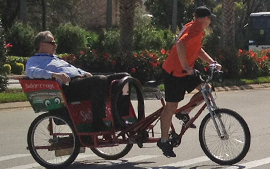 Sit back, relax, and enjoy the sites of the world famous International Drive with a pedicab tour. Whether alone or in a group, our drivers will keep you entertained. Get people to your front door, literally, with Pedicab advertising complete with word-of-mouth referrals, pedicab branding, and coupon distribution. 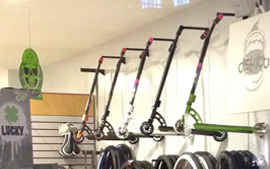 Our sister company, Redi To Pedi, on International Drive in Orlando, Florida offers pro, freestyle, kick, and stunt scooters from Madd Gear, Lucky, Phoenix, and more.